Now in the same pan saute eggplant for 5-10 minutes add 1/2 tsp salt and 1/2 tsp mixed herb and saute this for 2-3 minute. Keep this separate with zucchini. 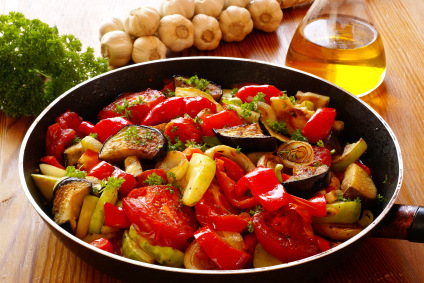 Now saute red bell pepper for 1 minute with 1/2 tsp salt and herb and keep this also with other vegetables. Now heat oil in a separate pan and saute onions and garlic in this oil for 2-3 minutes. Sprinkle Parmesan cheese in the end over the vegetables and mix them again once. Garnish this with parsley and serve hot.